Finished reading Drums of Autumn (Outlander, Book 4) by Diana Gabaldon. 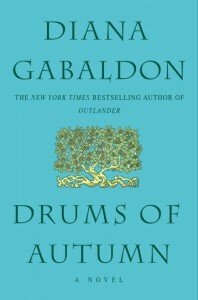 Drums of Autumn continues with Claire Randall, who stepped through the stone circle at Craigh na Dun and landed in Revolutionary America, and her new husband Highlander Jamie Fraser. Bree, Claire’s daughter, discovers that Jamie Fraser is her real father not Frank Randall, Claire’s first husband. In order to meet her true father Bree follows in her mothers foot steps and travels back in time using the stone circle.